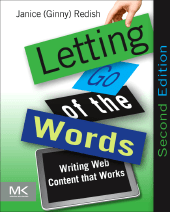 This month, I’m enthusing about Ginny Redish’s new book Letting Go of the Words: Writing Web Content that Works (Morgan Kaufmann). If you write, or your clients write, then you’ll learn from it. If you’re working on a content-rich website: you’ll learn from it. But hang on, I can hear you say: we can all write. Our bookshelves are all groaning with stuff that we’ve not quite got round to reading yet. Why is this book different? One easy answer is that it’s got enthusiastic reviews from Steve Krug, Jakob Nielsen and Lou Rosenfeld. Not yet convinced? OK, I’ll dig a little deeper. It’s simple enough to type in a few words and spaces. Or, in my case, being a wordy person: far more words and spaces than anyone might reasonably want to read, then spend ages trying to cut them back into something that might hit the mark. And I think that’s the difficult bit: achieving crisp, clear sentences that accurately convey the right message and grab an audience. Ginny has been improving documents (on and off the web) forever. As Steve Krug puts it; “She’s forgotten more about writing and reading than most people will ever know”. But the point about Ginny is the way that she shares her knowledge: crisp, clear sentences that gently explain what to do – and why. Plentiful examples. Before-and-after case studies. And from everywhere: she doesn’t hesitate to tackle the tough stuff, like legal information or complex government web pages. But you’ll also find kids’ sites, universities, museums, e-commerce, banks: everything annotated with its good and bad points. I learned a lot when I read it. You may spot that I’m one of the people she thanks for ‘reviewing drafts and offering excellent suggestions’. What she’s too modest to mention is that 90% of my comments were “fantastic, write more of this” and the other 10% were suggestions for examples, usually those that had improved after I tried her ideas. If this book was just about helping us to improve our own writing, I might selfishly have decided to keep it to myself. The big deal for me is how it’s helping me with clients. It’s just so much quicker to say “let’s see what Ginny says” on a subject, like how to design a good list. Or instead of trying to explain (yet again) why ‘click here’ links don’t work: look it up and use her explanation. I was actually quite tempted to sacrifice a copy by tearing out the four-page table of contents to use as a quick reference guide. Here are a few guidelines that I know I’ll be using: “Give people only what THEY need”; “Market by giving useful information”; “Start with the key point”. And those are taken from just one of the 13 chapters. But I’m finding that it’s best to carry the whole book with me so that I can jump directly to the point I want to make. Not my own, but a spare – so that I can graciously hand it over after winning the argument (“PDF versus web page”, anyone?). It’s less than £20 ($35 US) from Amazon, the client enjoys receiving it, and it may save us a few costly discussions in the future. What’s not to like? If I’ve given you the impression that this book is just a ‘dip into’ box of goodies, then I’ve undersold it. It’s also a structured process, starting you with thinking about your users (“People! People! People!”), and proceeding from the high level (for example, “Thinking about information, not documents”) through the detailed (such as “Using lists and tables”) to “Getting from draft to final web pages”. Did you spot the missing step? Yes, you’re right: there’s no chapter on usability testing. Ginny co-authored Dumas and Redish (1993, revised 1999) A Practical Guide to Usability Testing (Intellect Books). She’d never claim to have invented usability testing but she certainly pioneered it. So I was a bit surprised to find that she’d not included it. But then I realised: she has. It’s there throughout the book, when she points out what you ought to be testing and why. No fuss: just do it and learn. Same as the whole book really: no fuss, just read it and learn. Previous Previous post: Differences between participants and users: representative or not?